Does the Downtown Sailing Center (DSC) Rent Boats? The DSC does not rent boats. "Skipper Level" members, after passing a skipper checkout, may take out the J/22s, Sonars, and other daysailing keelboats (20'-23' in length with no motor). "Crew Level" members and "Skipper Level" members can take out Access Dinghies out as well, once an orientation and checkout has been completed for those boats. If you do not live in Baltimore, we strongly encourage you to check out our lessons and events or look for an open house sailing opportunity. The DSC grants reciprocity on a case-by-case basis with other US Sailing Community Sailing Centers with adequate advanced notice. If you live in Baltimore only part-time or are visiting for an extended stay and would like to become a member, please call the office at 410-727-0722 and talk to one of the professional staff. Members sail at their own risk and take responsibility for the vessels they reserve. Powerboat support is typically limited to structured programming, such as member sails, lessons, camps, and our Thursday Night Racing Program. As a member, can I take boats out whenever I want? Boats are reserved on a first-come, first-serve basis through an online reservation portal. On Wednesday evenings and Sunday afternoons, all boats are reserved for social "member sails" for "skipper-" and "crew-level" members (no private reservations). On Thursday evenings, the J/22s are used for racing. Otherwise, all of the boats are up for grabs. For more information about our fleet, click HERE. Private reservations are limited to 4 hour time slots during daylight hours only, and we do not allow any sailing if a Gale Warning is posted for our area. What is the sailing like in Baltimore? Baltimore City helps create a wonderful sea-breeze from April through most of September (with rare exception). The harbor and its cityscape creates a sailing playground with flat water and shifty winds, with winds steadying and the chop increasing as one sails outbound toward the Key Bridge. Fort McHenry is typically a forty minute sail away, and experienced sailors can make it half-way to the key bridge and back in about 3 hours. Unlike most sailing venues in the Chesapeake, there are only a few shoals or rocky areas to avoid. In the spring and fall, Baltimore experiences relatively standard system-driven winds, though the winds can be moderated or amplified based on wind direction by the city skyline. I heard the water quality is poor. How does that affect the sailing? All of our boats, as of October 2017, are currently equipped with a weighted keel (J/22s, Sonars, & Freedom 20s) or a weighted dagger board (Access Dinghies), so you should not be swimming in the water if you are sailing. Baltimore's Inner Harbor and Middle Branches do suffer from an aging water infrastructure, but 99% of the time the water is not a limiting factor on quality sailing. 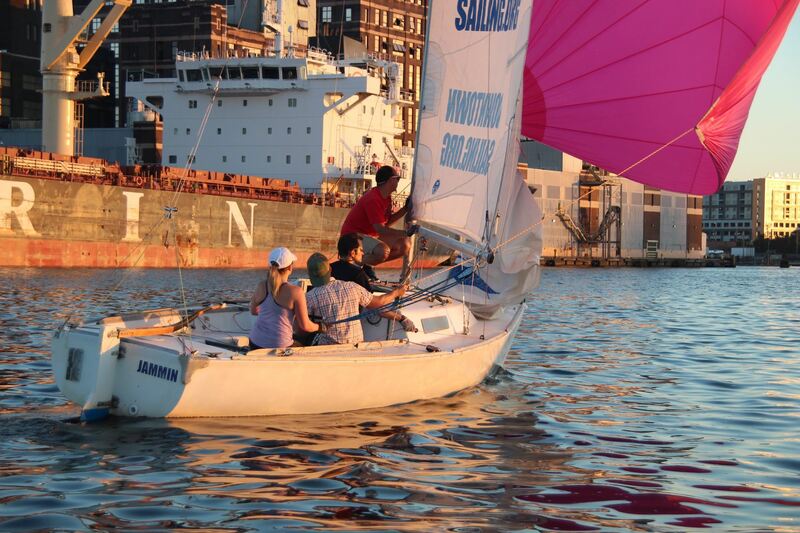 Additionally, the Downtown Sailing Center is partnering with the Waterfront Partnership, Blue Water Baltimore, and the Chesapeake Bay Foundation to encourage Bay health and promote water quality improvement initiatives. Come sailing with us! Will the sailboats flip over during lessons or recreationally sailing? Our sailboats do tip a bit because they have rounded bottom shapes BUT THEY DO NOT TIP OVER. Fortunately, our boats are equipped with underwater fins called "keels" that provide righting momentum against the force of the sails. Under normal, safe sailing conditions, our boats will remain upright and dry (or at least mostly so). Our keelboats are specifically designed to stay upright and not flip over "capsize." We do not hold lessons or events in conditions that would cause persons to go overboard, and our sailboats do not flip over when we go sailing. What is the policy for classes and for event registrations? Officially, your event registration is not confirmed until you have paid for the event. Due to the fact that we must manage and recruit staff at a ratio of 3: or 4:1 (student:instructor) for most programming, we only guarantee your spot on an event roster once you have paid for the event. If an event is postponed or cancelled due to weather such as high winds, heat or cold advisories, or severe weather, we will work to reschedule your class the following weekend or reimburse your lesson/event costs if the class cannot be made up. Do you sail in the rain? As long as the weather is not such that clients and sailors are likely to experience hypothermia, we are likely to sail in the rain. Sailing is fun; and sailing in the rain can be fun; but it is not always safe and fun to sail in the rain. Our coaches, staff, and professional team strive to make sure all events are top-notch and of the highest quality. Sometimes, this means you will go sailing in the rain (advance sailing lessons, Basic Keelboat lessons); othertimes, this means you may stay shoreside (kids events, sailing with persons with disabilities, Taste of Sailing lessons). The DSC is located on the grounds of the Baltimore Museum of Industry, 1425 Key Highway. Our docks and boats are down by the water and the large majority (90+%) of our lessons, activities, and events take place outside, either in the shade or occasionally under the big green pavilion. Our shortest lessons typically skip the land-based portion of education and are conducted nearly-entirely from the docks and on the boats. Is there on-site parking and is it free? The DSC has access to parking in the lower-level gravel lot down by the waterfront. DSC clients and members, please park in the gravel lot! Occasionally, the parking lot may be closed for private Museum of Industry events, in which case we recommend parking along Key Highway or Key Highway Extension. Also, we strongly encourage cycling, walking, or public transport as part of a healthy and clean way to improve our fair city.